Subtitle: What is to be Learned? Notes: This essay was first published in Catamount Tavern News, 2008. When activists, liberals, and radicals descended on St Paul, MN, to protest at the Republican National Convention a couple of months ago, they arrived with the hopes of disrupting the Convention, voicing their distaste for the platform and tactics of the conservative movement, and demonstrating to the powers that be that they will not sit idly by as our world is sold off to the highest bidder at the expense- and exploitation- of working people the world over. At the end of the week, nearly 1,000 people had been arrested, thousands had been injured by police violence, thousands more had been given a first-hand showing of how little the “rule of law” matters to police forces, and the program, comfort, and message of the GOP and other authoritarian elements of the State had been shaken. Throughout the past decade, the anti-authoritarian left has gone through some rapid changes in the United States. The “summit hoping” street demonstrations that began at the 1999 Seattle WTO enjoyed several years of increased militancy and sophistication before slowing to near non-existence and ineffectiveness over the second half of the past ten years. Partially, this slowing was the result of several key elements of the movement re-assessing the effectiveness and long-term strategy of such actions within the overall goal of building a popular movement capable of challenging and dismantling capitalism and the State; partially this slowing came as the increasingly formulaic nature of such demonstrations limited the effectiveness and creativity of street actions while simultaneously strengthening the (police) State’s ability to respond and squelch such protests. Organizers for the RNC protests sought to change all this. Over a year and a half before the RNC, a coalition of local radicals joined with committed organizers from other corners of the country in order to plan, coordinate, and implement a multi-layered and diverse array of actions and street tactics which- they hoped- would allow for an optimal amount of disruption of the RNC and the city of St Paul. They sought to plan and coordinate, not in a top-down and controlling manner but in an open and embracing one, a week of demonstrations that could serve to effectively challenge the illusion of the State’s authority, discredit the Republican vision of what our world should look like, and expose to the light the horrific and anti-human nature of the State itself. In many ways, they were more successful than any street protest in the U.S. in recent memory. The RNC Welcoming Committee, as this organizing body named itself, had a few things going for it that were not so much their own doing but which they nonetheless we able to capitalize on. Most glaringly, after eight years of rule under the far-right Bush regime, dissent and militant rejection of the status quo is at a high unmemorable to millions of Americans. Along with this, the relatively progressive and “common sense” nature of the people of Minnesota’s Twin Cities meant that not only were their a number of solid and experienced resources and organizations already on the ground, but expanding popular support for radicals and radical action throughout the population was easier than, say, if the RNC were being staged in Houston or Atlanta. One thing that the RNC Welcoming Committee was able to accomplish quite successfully was to allow differing groups of radicals- with differing priorities and preferred tactics- to engage on the streets without having to solidify through spokescouncil meetings into a larger body with a unified plan of action. The RNCWC did develop a mission statement and a document of unifying principles under which participating factions could operate, but the decentralized nature of this structure allowed those interested in closing down highway ramps to do so, those interested in holding intersections to do so, those interested in marching on the convention center to do so, and those interested in other tactics to do so. Of course, this was only possible as a result of the large numbers that were preparing to go to St Paul, but it illustrates the effectiveness of the nature of anti-authoritarian organizing. And the results on the ground were impressive. The RNCWC was able to successfully coordinate with various blocs which groups would take which tactics, and so amongst the pagan bloc, the IWW anti-capitalist bloc, the black bloc, the student-oriented “funk the war” bloc, and others there was a consorted effort to hold various different main thorough fares leading into downtown and to the convention center itself. Along with this, smaller affinity groups were enabled, and given the umbrella support of RNCWC coordinated support networks such as legal, media, and medical teams, to “lock down” and block highway off ramps and other secondary arteries with very small numbers. The de-centralized nature of hitting the streets on multiple fronts enjoyed the effect of splitting police forces and bringing near chaos to their efforts to control protesters. In addition, the RNCWC was able to successfully coordinate the more militant blocs in a manner that gave room- notably without insurmountable conflict- to less militant protest groups which were also in the streets to protest the RNC. Chiefly among these, the “Poor People’s March”, consisting of thousands of local working class people (predominantly African Americans) who wanted to march on the RNC and demand an end to the poverty which Republican rule had exasperated upon them, was able to plan their march in a manner which did not place them directly in danger of street clashes between anarchists and police. As one militant bloc, attempting to out-maneuver riot cops in the streets, joined up with the Poor People’s March, march organizers spoke into their megaphones: “for you folks dressed in black, if you’re going to join us on our march, we welcome you! we just ask that you remain in the back so that we don’t get attacked by the police- we’ve got children and elderly people up here”. Among the various militant blocs on the streets, the IWW anti-capitalist bloc and another, fairly classical looking black bloc, both demonstrated levels of maturity and tactical sophistication that seem noteworthy in the recent history of street militancy. Both these blocs marched in tight formations, employing banners on all four sides to demarcate their ranks and keep-out, as best as possible, agent provocateurs who were running rampant throughout St Paul, and both these blocs worked with internally established goals, signals, and roles for various individuals. The relative sophistication of their structures allowed for these two blocs to successfully operate on the streets of St Paul throughout the entire week of the RNC, and at various times to successfully hold major intersections and in fact blockade a number of delegate buses on their way to the convention center. Less militantly focused groups were provided with other outlets- such as the “party empire away” oriented “Funk the War” bloc, so that these more militant blocs were able to operate along lines which allowed for more confrontational- and coordinated- tactics. 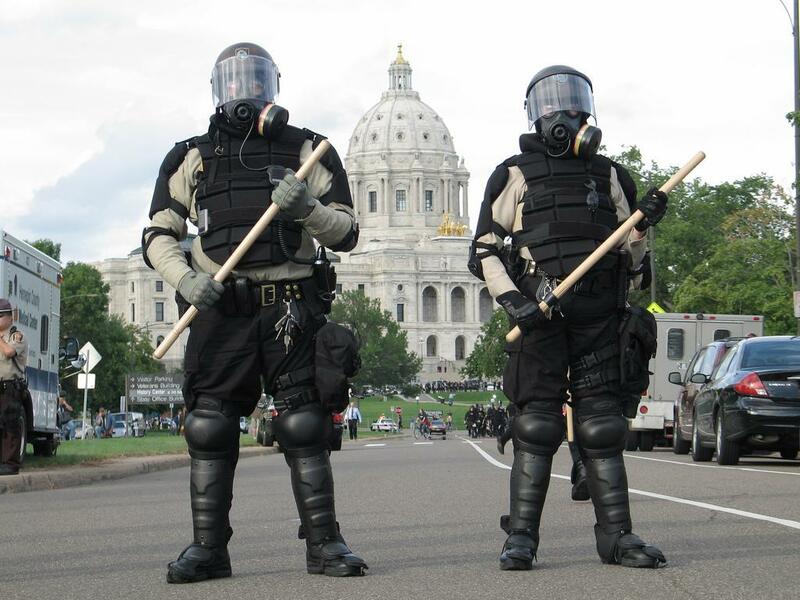 This, in turn, left police units in chaos and unable to adapt accordingly to the varying tactics of differing blocs, which turned into a PR nightmare for the SPPD and the Ramsey County sheriff office, who over the course of the week were increasingly being asked to be accountable for the heavy-handed tactics. George Bush never made it to the RNC, and in fact the entire schedule of events was largely thrown out of order. The GOP blamed this on hurricanes in the Gulf, and no doubt Bush’s failure to show came down in part to the simple fact that no one, not even Republicans, are interested in aligning themselves and their reputations with such an unpopular president, but the simple fact of the matter is that for an entire week anti-authoritarians and other demonstrators were hugely successful in exposing the illegitimacy of the government’s claim to have “control” of the population, and the shocking degree of violence which they’re willing to wield in order to stamp-out decent. Most importantly, anti-authoritarians demonstrated that such a strategy can prove highly successful in confronting police forces on the street as well as moving the mainstream press- albeit very slowly- in line with our message. When reporters for Fox News find themselves being swept-up in police riots and mass arrests, it becomes hard to spin the story.